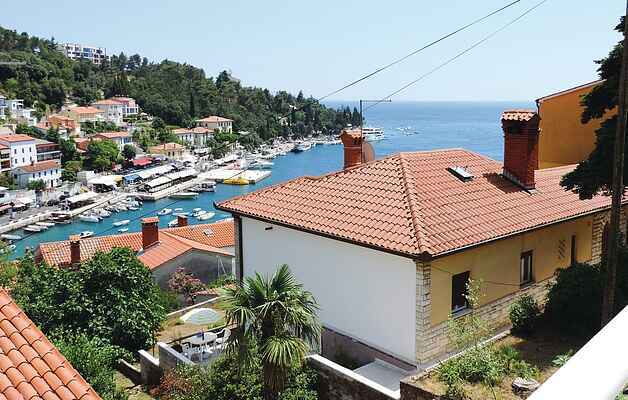 Spend a wonderful summer holiday in the popular holiday resort of Rabac and stay thereby in this simply furnished but attractive holiday apartments CIO087 and CIO198, which are located in the family house. Enjoy the splendid sea view that is offered by the hillside location as well as the proximity to the lively town center with all its facilities and amenities. Stairs lead to the apartments. Both have comfortable terrace overlooking the sea, while the terrace of the CIO198 apartment is the passing one. Apartment CIO087 has a parking space on the plot, while for CIO198 parking is possible in the public parking nearby. Pleasant bathing fun is guaranteed on the beautiful pebble beaches and in the crystal clear sea water. Along the promenade, there are many bars, restaurants and souvenir shops, where you can buy a small souvenir for your loved ones. A visit to the picturesque old town of Labin, where many summer events are held, is recommended.